Satisfy your appetite for lunch or dinner at the hotel's restaurant, or stay in and take advantage of the room service (during limited hours). Unwind at the end of the day with a drink at the bar/lounge or the poolside bar. Continental breakfasts are available daily from 8:30 AM to 10:30 AM for a fee. Take advantage of recreational opportunities offered, including an outdoor pool, an indoor pool, and a sauna. Additional amenities at this hotel include complimentary wireless Internet access, concierge services, and a hair salon. Located in Oropesa del Mar, Hotel Kalma Jardín de Bellver is by the sea, a 1-minute drive from Voramar Beach and 5 minutes from Almadraba Beach. This family-friendly hotel is 1.7 mi (2.8 km) from Church of Santo Tomas and 1.7 mi (2.8 km) from Church of Santo Tomas de Villanueva. Take advantage of recreational opportunities offered, including an outdoor pool, an indoor pool, and a spa tub. Additional amenities at this hotel include complimentary wireless Internet access and concierge services. This hotel is located in Benicasim, directly on the Costa del Azahar. The fine-sand beach is some 300 m away. The town centre is just a few minutes' walk from the hotel. This beach hotel was renovated in 2002 and comprises a total of 70 rooms. Facilities on offer include a foyer with a reception area and a lift. The hotel also offers its guests a bar, a games room, Internet access, a laundry service and an air-conditioned restaurant. A playground is also to be found outside the hotel. Parking facilities are available for those arriving by car. The functional rooms come with an en suite bathroom, a hairdryer, a king-size bed, a direct dial telephone, a fan, satellite TV, a hire safe, central heating and air conditioning. The hotel offers use of a freshwater swimming pool (fees apply) with a hot tub. Guests may also make use of the pool table. Breakfast may be selected from a buffet. The TRINIMAR HOTEL, located right on the beach, is perfect for a holiday next to the sea and practising water sports. Of particular note are the panoramic views of the promenade, of the garden and of the swimming pool. It's 170 rooms offer customers a functional and pleasant environment. Customers can park their car the external car park. Facilities include Air Conditioning. This hotel boasts a privileged location on Torre Sant Vicent Beach, in Benicassim. It is located close to the centre of the city, as well as the main leisure and entertainment district. Many major attractions can be found within easy access of the hotel. A wealth of shopping, dining and entertainment opportunities can be found nearby. This hotel welcomes business and leisure travellers alike. The elegantly-styled guest rooms focus on functionality and comfort. The hotel features a warm, friendly ambiance, offering a personalised service to ensure a high level of quality. The hotel's facilities and services ensure that the needs of every type of traveller are fully met. Take advantage of recreation opportunities such as an outdoor tennis court or take in the view from a rooftop terrace and a garden. Additional amenities at this Mediterranean hotel include complimentary wireless Internet access, concierge services, and babysitting/childcare (surcharge). Make yourself at home in one of the 73 air-conditioned rooms featuring flat-screen televisions. Complimentary wireless Internet access keeps you connected, and satellite programming is available for your entertainment. Private bathrooms with showers feature rainfall showerheads and complimentary toiletries. Conveniences include safes and complimentary bottled water, and housekeeping is provided daily. 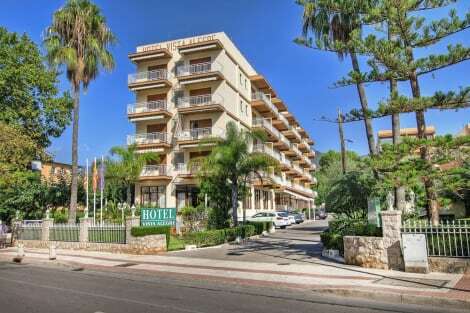 Small hotel with peaceful rooms completely refurbished in 2010 with stylish, and modern decor. It has a pool, garden cafe, air conditioning, heating, elevator, fax and free Wi-Fi. Pets allowed. The hotel offers affordable service laundry and ironing. At reception you submit all the required information and tourist information and car hire bikes. Benicàssim is a traditional Spanish beach resort located 13km north of the town of Castelló de la Plana, at the north of the Valencian Community. It is the site of the famous music Festival Internacional de Benicàssim and boasts 6km of sandy beaches, all with Blue Flag quality certification. With its warm blue waters and other accolades, it's easy to see why so many flock to Benicàssim hotels in this little locality of Costa Azahar. The annual Festival Internacional de Benicàssim focuses mainly on pop, rock and electronica music artists, but also features short films, fashion shows and art. It has a strong reputation as being among the best on the international festival circuit and attracts over 50,000 people over four days in July. Music is not the only reason for Benicàssim's popularity. The warm climate and clear sea makes it perfect for diving, swimming and sailing. The more adventurous may like to go hang gliding, paragliding or even skydiving. Hikers and cyclists can find pretty and varied trails amongst the mountains surrounding Benicàssim, which are home to the Bartolo Peak. There are also other sports facilities in the area such as a golf course, beach volleyball and football fields. But those who are here for the sun may just want to spend time lazing on one of the five beautiful beaches for which the town is famed. Of course, it's not all about sports and swimming, and there are some beautiful old buildings in the area to visit and learn about. 16th-century Torre de San Vicente (Saint Vincent's Tower) is one of 18 watch towers that were built along the coast of the Castellón province. The exterior is still in quite good condition, and it is set amidst pretty gardens and a leisure area, close to a great beach. The Convento Viejo de los Padres Carmelitas (Old Monastery of the Carmelite Fathers) is nothing more than ruins now after being destroyed in an earthquake in 1783. It's a superb setting, surrounded by orange groves with remarkable views over the sea and the valley, which leads back down to Benicàssim. Visits are possible. However, it is necessary to contact the Carmelite Fathers beforehand. Restaurant Pizzeria La Manduca in Benicàssim offers high-quality, well-priced Italian food served by English-speaking waiters within clean, ultra-modern surroundings. It has a large, varied multi-language menu with pasta, pizza, meat, fish and paella dishes. The highly recommended Jotas la Pau serves up extra fine dining for a mere €12.50 a head. With dishes such as seafood soup and delicious warm bread, roasted quail with vegeSEOSITE_LEVEL_DESCRIPTIONs, chocolate tart and mascarpone cream with strawberry confit, you'll find it very difficult to be disappointed! The restaurant is spotlessly clean, the service attentive and the surroundings pleasant.